This is designed for price action, scalping. Open orders by bar height when bar height meet math calculations. 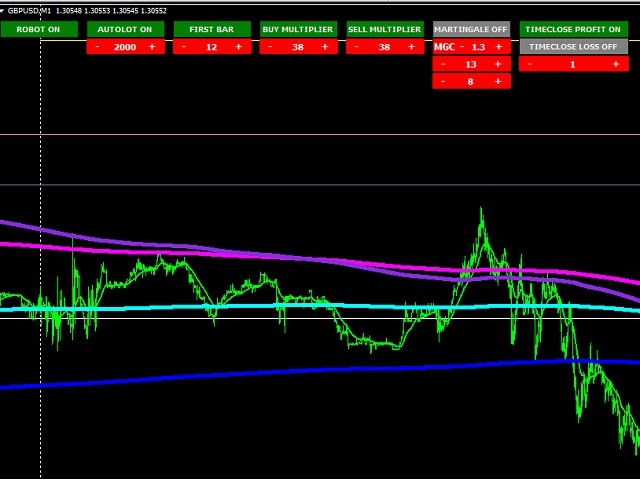 Timerame is M1 and works all forex symbols. It has continuously double trailing system. Set hours to trade 3 independent hours set. Set lots static or grow by balance. Variable lots by bar height. Set bar value by ATR indicator automatically. Close safety by time in minutes and close your order after x minute even if it is not in profit or loss by you. Set stoploss and takeprofit values by ATR indicator automatically. If you need help or have questions, please contact me first. Every major settings can be set automatically by robot, no need to know how to use. 2003 to 2019 Dukascopy backtest results for EURUSD. %1.55 max drawdown and %99.9 test quality. 1000$ to 5.000.000$. Auto Lot increase by bar - Increases lot by bar height one more time. First Bar - Bar value for robot. ATR set this automatically so no need to change. Max order - Recommended “1”, but your lot size is low by balance then can set it up to 5. Use ATR for First Bar - set true for automatic adjustment first bar. true. DO NOT CHANGE. Atr Period - Atr period. 480. DO NOT CHANGE. Atr Time Frame - Atr time frame. 30 Minutes or 1 Hour. TIME SETTINGS - Values for trade hours, every set evaluated by itself. Robot will not work out of these hour sets. Close in profit - Set true for close orders in profit after x minutes. Close in loss - Set true for close orders in loss after x minutes. Close orders after x (minutes) - close orders after X minutes. Order send 130 error fixed.